I'm in Tucson visiting my sister - who just had twins - and already has a 3 year old and 2 year old!!! Last night, after everyone was FINALLY asleep, she sat down and we had a little craft therapy together. I'm so proud of her! Look at what a good job she did! Two button flowers, a rolled flower and a wool flower. We were experimenting with a "scrunched" wool flower and it turned out pretty good. 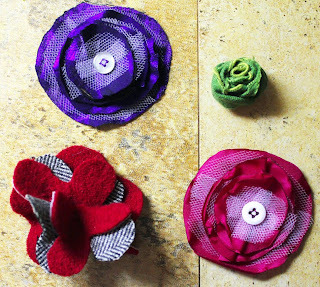 Do any of you have any good re-purposed wool flower tutorials you can share with us?? ?